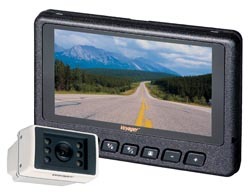 Features a brilliant 7” color LCD monitor with built-in speaker and a color Night-Vue™ camera with microphone. Monitor has 2 camera inputs via hideaway junction box. Includes an adjustable 4” pedestal, sunshield and 65’ cable. 12 volt DC. Monitor 7-3/4”W x 5-1/8”H x 7/8”D. Camera 3-3/4”W x 1-7/8”H x 2-5/8”D.